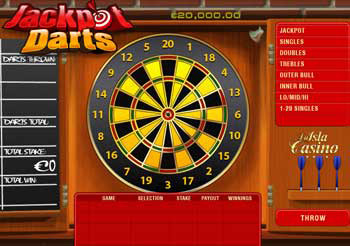 Your objective is to place various bets on where the three dart throws will hit. Click the bet menu in the upper right corner of the screen to open and close sections containing the bet options. The payout multiplier is shown next to each bet. Select a bet option, use the + and - buttons to increase and decrease your bet amount, then click on Confirm to place the bet. You can place up to five bets per game round. The dartboard consists of the single ring, the double ring, the treble ring, the outer bull and the bullseye. The single ring is the largest part on the dartboard. It consists of two areas - one between the double ring and the treble ring, the other between the treble ring and the outer bull. It is divided into sectors which are colored yellow and black. Each sector has a certain number, written on the outer edge of the dartboard. A dart that hits the single ring scores as many points as the number written on the corresponding sector. There are two narrow circles on the dartboard. The outer narrow circle is the double ring, the inner narrow circle is the treble ring. A dart that hits the double ring scores double the amount of points of the corresponding sector. A dart that hits the treble ring scores triple the amount of points of the corresponding sector. The outer bull is the small circle surrounding the bullseye. It is worth 25 points. The bullseye is the center of the dartboard, it is worth 50 points.